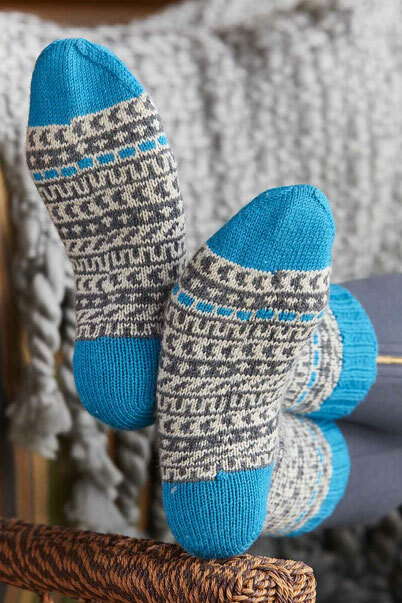 Accented Socks - monemades Webseite! These socks are worked cuff down in starnded knitting, mainly in two neutral colours. The eye-catching feature is the use of a third, bright colour for cuff, heel and toe as well as for two 'accent stripes'. The socks are worked with a short row heel, which is worked with decreasing and increasing stitches rather than the usual wrap and turn technique. I, personally, consider it it a perfect heel for beginner sock knitters. The pattern is included as a bonus pattern in Knitscene, which is available in print and for digital download from the Interweave website, here.